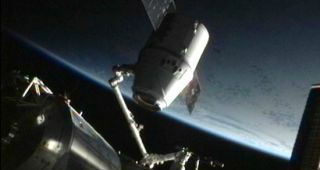 SpaceX's Dragon space capsule is detached from its docking port on the International Space Station on May 31, 2012 ahead of the spacecraft's return to Earth to end its first voyage to the orbiting lab. The recent rise of private spaceflight has stolen some of the spotlight away from NASA, but the space agency doesn't mind a bit. Last month, SpaceX's unmanned Dragon capsule became the first private vehicle ever to dock with the International Space Station (ISS), and the craft will likely start making regular supply runs to the orbiting outpost this autumn. SpaceX hopes a crewed version of Dragon will be ready to fly astronauts to the station by 2015 or so, and a handful of other companies are developing their own manned spaceships with similar timelines in mind. But NASA is not threatened by this new private space race; rather, the agency has actively encouraged it, so that it is able to focus its human spaceflight efforts farther afield. Over the past several decades, NASA spent about $209 billion sending astronauts (along with some cargo) to low-Earth orbit and back. That's the rough cost of the agency's space shuttle program, which retired last July after 30 years of orbital service. In 2010, President Barack Obama instructed NASA to get astronauts to an asteroid by 2025, and then on to the vicinity of Mars by the mid-2030s. The agency is depending on private firms to take over the shuttle's orbital-taxi role while it puts its limited resources toward achieving these ambitious deep-space goals. NASA has given money to four companies — SpaceX, Blue Origin, Boeing and Sierra Nevada — in the hopes that at least two of them can have crewed vehicles up and running by 2017. Until that happens, NASA astronauts will continue to hitch rides on Russian Soyuz spacecraft, at a cost of roughly $62 million per seat. So agency officials were elated with the success of Dragon's demonstration mission. "Now more than ever we're counting on the inventiveness of American companies and American workers to make the International Space Station and other low-Earth orbit destinations accessible to any and all who have dreams of space travel," Bolden said in a statement last week, after Dragon splashed down in the Pacific Ocean off the coast of Baja California. For its part, NASA is working on ways to get astronauts to near-Earth asteroids and beyond. It's developing a huge heavy-lift rocket called the Space Launch System (SLS) and a capsule known as the Orion Multi-Purpose Crew Vehicle. The gumdrop-shaped Orion capsule is designed to carry up to four astronauts. NASA hopes to launch an unmanned Orion on an orbital test flight in 2014. The first test flight of the SLS isn't slated until late 2017, so Orion's maiden journey will likely take place aboard a Delta 4 Heavy rocket. The space agency has said it hopes the SLS-Orion combo will carry its first crews by 2021 or so. Robotic exploration has also been keeping NASA busy. In 2011, the space agency launched three unmanned missions to solar system bodies beyond Earth — the Juno spacecraft to Jupiter in August, the twin Grail probes to the moon in September and the Curiosity rover to Mars in November. The 1-ton Curiosity rover is slated to touch down at the Red Planet's huge Gale Crater on the night of Aug. 5, when it will embark on a two-year mission to study whether the area is, or ever was, capable of supporting microbial life. The future of NASA's robotic exploration program is somewhat up in the air, however. Obama's proposed 2013 federal budget, which was released in February, cuts the agency's planetary science funding by 20 percent, with much of that coming out of the Mars program. As a result, NASA has had to scale back and fundamentally rethink its unmanned Mars exploration program. For example, it pulled out of the European-led ExoMars mission, which aims to launch a rover and orbiter to the Red Planet in 2016 and 2018, respectively. Follow SPACE.com senior writer Mike Wall on Twitter@michaeldwall or SPACE.com @Spacedotcom . We're also on Facebook and Google+.